There are lots of vehicles in the Chrysler Group portfolio that could comfortably join the high performance family of the Street and Racing Technology (SRT) brand but according to Automobile Magazine, the newest addition will be a surprising choice with the future introduction of the Dodge Journey SRT6. When you look at the history of the SRT lineup, you see plenty of high performance cars, a pair of high performance trucks and a high performance sport ute but the Dodge Journey SRT6 seems like an unlikely addition to the storied SRT family. The Journey is expected to receive a refresh in the next few years which will usher in a new platform for the 5-door crossover and with that, Automobile is reporting that there will be a high performance variant packing V6 power. Nothing else is known about the Dodge Journey SRT6 but based on discussions I have had with some insiders over the past year – we can take a few guesses at what we can expect from the Journey SRT6. First of all, we can expect (or at least hope) that the Dodge Journey SRT6 will come with standard all wheel drive and we know, based on the nomenclature, that the SRT Journey will pack a 6 cylinder engine. Based on the immense popularity of the Pentastar V6, we should expect there to be some variant of that motor but unlike the current Pentastar V6 that offers a max of 305 horsepower in the entry level Dodge Challenger – the Journey SRT6 will need to pack much more power but just how much power will it offer? 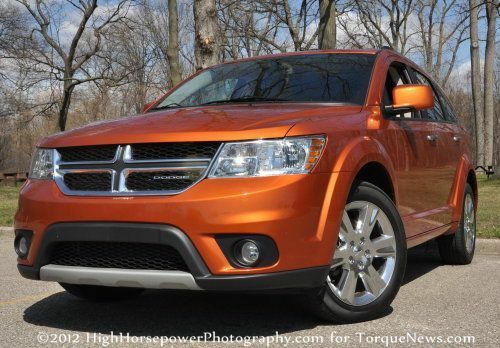 Typically when guessing at what kind of power a performance vehicle might pack, you look at similar vehicles in the class but there really aren’t any good models with which to compare something like a Dodge Journey SRT6. The only other smallish high performance crossover in America is the BMW X6 M, which packs 555 horsepower via a twin turbocharged V8 but it also costs over $93,000. The Journey SRT6 most certainly will not cost anywhere near $93k so it won’t need to live up to those kinds of expectations. Also, Chrysler is so proud of the Jeep Grand Cherokee SRT8 that I cannot see the company offering another high performance SUV-type model that would compete with the super-Jeep. With those factors in mind, I would guess that the Journey SRT6 would offer somewhere in the area of 400 to 450 horsepower. So how will Chrysler squeeze over 400 horsepower from the Pentastar V6? Forced Induction. A few months ago, I spoke with an employee inside of the Chrysler Group engine testing facility who filled me in on some interesting projects in the dyno lab including the Pentastar V6. These tests were pushing the power levels well above the 305hp output of the Pentastar in the Dodge Challenger and along with a higher performance naturally aspirated model, my informant explained that there were also supercharged, turbocharged and twin turbocharged variants of the Pentastar being tested. He wouldn’t offer any specific detail on the power output but he assured me that the “safe capabilities” of the twin turbocharged Pentastar V6 were enough to “blow away” Ford’s EcoBoost V6. I asked him very plainly if it would make more than the 365 offered by the Taurus SHO EcoBoost – to which he replied with a laugh and “oh yeah…easily”. Unfortunately, he wasn’t able to offer any idea as to why they were testing these supercharged and turbocharged engines at the time and he hadn’t heard of them being headed for any production models. It isn’t uncommon for automakers to put new engines through extreme testing for future considerations and with the news of the upcoming Dodge Journey SRT6, perhaps the reason for testing those high performance versions of the Pentastar V6 are a bit more clear. Of course, this is all just speculation and with the speed at which the new Fiat-run Chrysler Group moves, the Dodge Journey SRT6 could be powered by an engine that none of us have even considered but based on inside information and the popularity of the Pentastar V6 – the new high performance Dodge crossover could pack twin turbo power. The prospect of a 400-450 horsepower Dodge Journey SRT6 is certainly an interesting idea and while I am never one to question a performance model, it will be interesting to see how much of a market there is for a high performance crossover – and whether the company will find enough interest to put the Journey SRT6 in dealerships.